Wa, Nov. 30, GNA - Vice President Aliu Mahama on Monday inaugurated the new Radio and Television transmitted equipment at Wa and Han in the Upper West Region with a call on the public to make maximum use of the facility to improve their lot. He said, although a huge amount of money had been invested in the equipment, the government found it expedient to do so in order to open up the whole country through access to information by both radio and television. He called on the management and staff of various GBC stations to handle the equipment with caution so that future generations would also benefit from them. The transmission equipment at Wa and Han were part of the total 17 million Euro, the government provided to upgrade all the GBC radio stations throughout the country. With the installation, people in the region can now watch television from the satellite and not from Ghana Telecom as the situation was in the past. Madam Eva Lokko, Director General of the Ghana Broadcasting Corporation commended the to the government for upgrading their equipment to modern standard. Madam Lokko said the installation of the satellite equipment was to give meaning to the Presidential Special Initiative on Distance Learning, as many more people would get access to the programme. She promised that management and staff would work round the clock to improve on their programmes to make it competitive and attractive to the public. Madam Lokko announced that government was also working out a package to provide studio equipment and vehicles to enhance their performance. She said the management of GBC would do everything possible to justify the huge amount of money invested on their stations. The Vice President was on a two day visit to the region on Sunday joined the chiefs and people of the Nandom Traditional Area to celebrate their annual Kakube Festival. 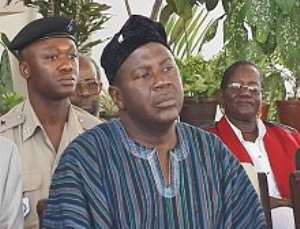 He also attended the funeral of late Sylvannus Ganfaa, former Lawra District Chief Executive.